(Nanowerk News) Physicists at the University of Houston’s physics department and the Texas Center for Superconductivity are working on an innovation that could boost vehicle mileage by 5 percent and power plant and industrial processing performance as much as 10 percent. Their research uses non-toxic materials – tin telluride, with the addition of the chemical element indium – for waste heat recovery. Telluride has been studied for years, said Zhifeng Ren, M.D. 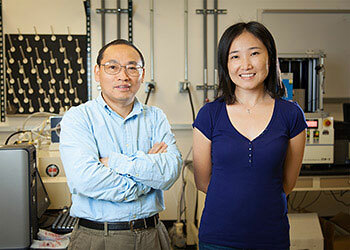 Anderson Chair professor of physics at UH and lead author of a paper describing the work, published in the Proceedings of the National Academy of Sciences ("High thermoelectric performance by resonant dopant indium in nanostructured SnTe"). But earlier work faltered because lead-containing telluride, despite its strong thermoelectric properties, can’t be used commercially because of the health risks associated with lead, Ren said. That has sparked the rush for a similar, but safer compound. “Without lead, there is a much better chance for it to be commercialized,” he said. The research shows the potential for building a device that can capture waste heat – from vehicle tailpipes, industrial smokestacks, power plants and other sources – and convert it to electricity to boost productivity. Ren and his research team arrived at UH in January from Boston College. This work continues his long-standing research into nanostructured thermoelectrics and thermoelectric energy conversion. The research was conducted with colleagues from the Massachusetts Institute of Technology and Boston College. Qian Zhang, a research associate in Ren’s group who designed the experiment, said she ultimately decided to add another element, known as a dopant, to alter the electrical properties of the tin telluride. In this case, she added indium to boost its conducting properties. In one example, the device could capture heat from a car’s tailpipe and convert it to power the car’s electronics, improving the car’s mileage by about 5 percent, Ren said. “Even 1 percent, every day, would be huge,” he said, considering how much crude oil is consumed worldwide. The United States and China, the world’s most energy-intensive nations, consumed 18.6 million barrels and 10.3 million barrels of crude oil daily respectively in 2012, according to the U.S. Energy Information Administration. And energy consumption in other countries is growing. ExxonMobil, in its annual energy forecast for the next 30 years, predicted global energy demand will increase 35 percent by 2040. The increase in demand makes even a small gain in efficiency valuable, Ren said, although he also said the process could be made more efficient in the future. But capturing car exhaust and converting it to electricity is only one example of how the process can be used. It could also be used in power plants – Ren suggested it could boost the conversion rate of coal-fired power plants from 40 percent to as much as 48 percent ­­­­-- and other industrial plants. In some cases, Ren said, the efficiency gain could reach 10 percent.